The American Communities Project releases its first report supported by the Robert Wood Johnson Foundation. 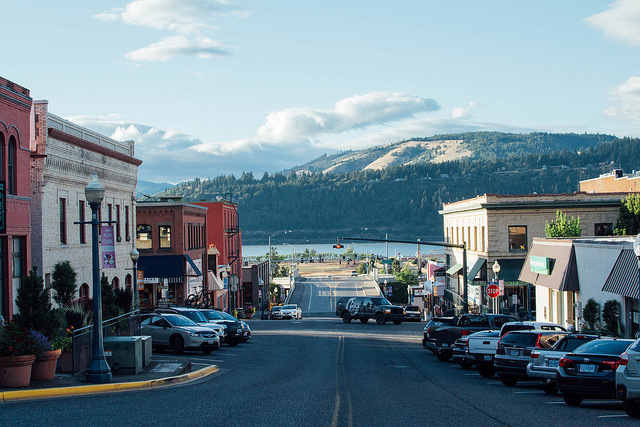 Nestled in the Columbia Gorge region, Hood River County, Oregon, is a gem of beauty and resources between two compass points: Mt. Hood to the south in Oregon and Mt. Adams to the north in Washington. When the wind and sun play along the mountainous, verdant landscape, it is almost hypnotic, initially obscuring the hardships and rifts in this Hispanic Center (pop. 23,232), where Latinos make up 31% of the population. Upon closer view, Hood River County shows how an interdependent culture facilitates partnerships and lays bare tensions— between ethnic groups, the affluent and underprivileged, out-of-town owners and full-time residents, rural character and increased density. The place’s relative isolation has pushed people to come together and join surrounding counties in novel ways. Hood River County scores well in the County Health Rankings compared to other Hispanic Center communities. Especially noteworthy are its low adult uninsured rates (only 13%) and physical inactivity rates (only 16% of adults report more leisure time physical activity, placing it with some of the best counties in the Rankings). But other numbers reveal more of the challenges the community faces as a Hispanic Center. The community’s segregation index score from whites and non-whites, 32, is high for a community that is so rural and evidence of the two communities that exist within the county. And the relatively high number of residents who are not proficient in English (9%) places it exactly in line with the Hispanic Centers overall, and high above the other community types. Community health workers have long facilitated residents’ connections with healthcare and social service providers. The successful model is now helping Latinos launch businesses. The county health department’s staff is bicultural, and a few nurses speak Spanish. Community health meetings are being structured to encourage people of different backgrounds to participate. Latinos are leading the design of a farmers’ market with food and activities they enjoy. The school district has hired a director of equity and family partnerships. Health is a finely connected, regional endeavor in Hood River; it begins with the Columbia Gorge Coordinated Care Organization predicated on the Oregon model. The CCO is “a network of all types of health care providers (physical health care, addictions and mental health care and dental care providers) who work together in their local communities to serve people who receive health care coverage under the Oregon Health Plan (Medicaid),” according to the Oregon Health Authority. 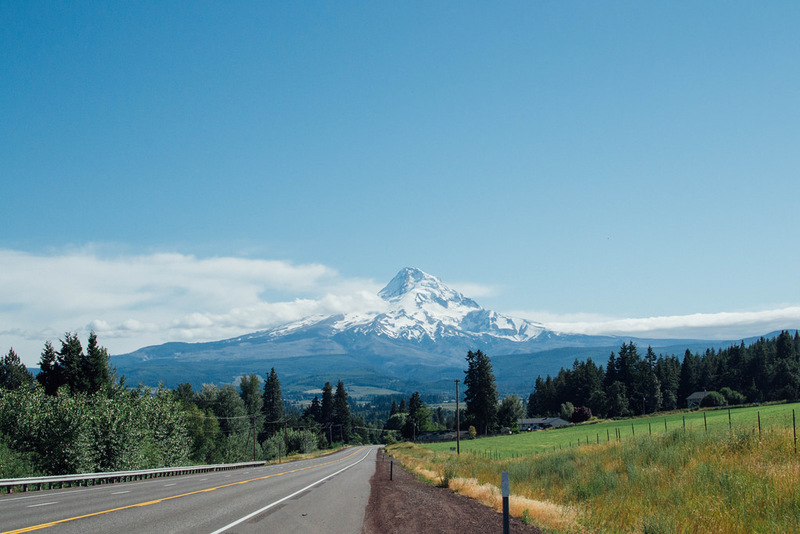 In January, Oregon voters affirmed continuing to fund Medicaid expansion, which the Hood River County Health Department credits with improving insurance rates. However, some residents don’t qualify because they lack documentation, and the county health department provides services, especially women’s care, to fill in the gap. The Columbia Gorge Region, Oregon and Washington, composed of Hood River and four other counties, earned the Culture of Health Prize from the Robert Wood Johnson Foundation in 2016 — and has since adopted the Foundation’s culture of health action framework to communicate its work. The area’s strength partly stems from the Community Advisory Council in which community members create and shape health and healthcare issues in the region. Community leaders in Hood River County also cite two particular impacts working toward a healthful culture: trusted community health workers who help residents, particularly Latinos, navigate the healthcare system and a grant writer who connects programs, providers, needs, and funders. Collective Impact Health Specialist Paul Lindberg is supported by Providence Hood River Memorial Hospital and works through the United Way of Columbia Gorge. Since 2014, he’s helped bring in $9.5 million in public and private grants, and brings together advocates through this role and as council chair. The next frontier is identifying what success looks like in the Community Health Improvement Plan. This means setting metrics, employing research and data gathering methods, and analyzing data to make evidence-based decisions, Lindberg says. It also involves identifying service gaps. “Part of my job…is to pull partners together, design programs to fill those gaps,” he adds. For this high-cost-of-living community where the median income is $53,900, improving access to food, transportation, and housing — key social determinants of health — is progressing. Gorge Grown Food Network’s Veggie Rx program giving vouchers to community members for fresh fruits and vegetables has expanded to women in the WIC program in collaboration with the health department; Gorge Grown also runs a mobile farmers’ market. In June, Columbia Area Transit expanded bus services, including fixed routes. Housing remains a wicked problem in the county, requiring the kind of resourceful, collaborative mindset that has long defined the region. The U.S.A.’s story in the Columbia River Gorge officially opened when pioneers U.S. Army Captain Meriwether Lewis and Second Lieutenant William Clark charted this new territory in 1805-1806. History highlights continuous reinvention — the early fur trade was supplanted by the timber industry, which fell off in the 1990s. A painful chapter was written in World War II with the evacuation and internment of Japanese Americans, a sizable population in the region. 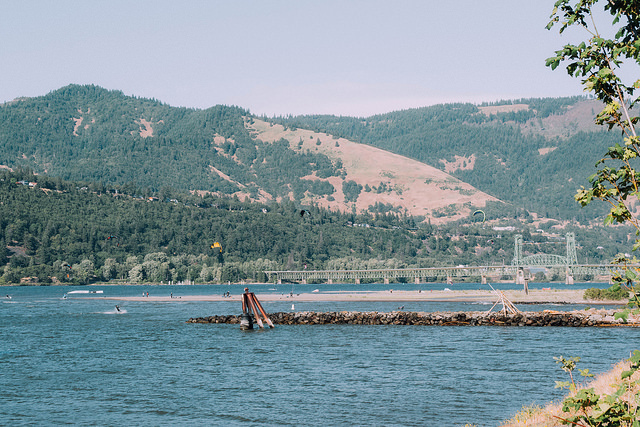 In the 1980s, windsurfers put Hood River on the map as a vacation destination. Outdoor adventurers flock here for the kiteboarding, wind and kitesurfing, mountain biking and more. In 1986, the U.S. designated 292,000 acres as the Columbia River Gorge National Scenic Area to protect the local environment and spur the economy. Kite and windsurfers enjoy ideal conditions on the Columbia River in Hood River, Oregon. Tourism and hospitality have flourished in Hood River County. Mom-and-pops — charming coffee shops, trendy restaurants and breweries — are plentiful in the downtown area. Hood River also ranks among the top 10 small communities for the arts, particularly for its independent artists, arts and culture organizations, and dollars contributed, according to the 2018 NCAR Arts Vibrancy Index. Tech entrepreneurs harnessed the wind resource in the late 1990s to catapult a thriving drone industry. Insitu, a subsidiary of Boeing that develops and manufactures unmanned aircraft systems, is stationed in the county. In September 2017, its ScanEagle unmanned aerial vehicle helped firefighters battle the Eagle Creek Fire, which consumed nearly 50,000 acres of the Gorge. A year later, parts that had turned black are green again. That burgeoning tech industry is growing along an agricultural economy that has been the constant through the years. A microclimate makes the Hood River Valley fertile ground for many fruits. It’s top in pear production; cherries, apples, and grapes aren’t far behind. A popular tourist attraction, the 35-mile Hood River County Fruit Loop is dotted with farm stands selling fruits, vegetables, wines, ciders, etc. Many family orchards date from the 1800s, though agribusiness, tariffs and worker shortages now threaten. Seasonal migrant workers play an instrumental role by picking crops; many are housed on farms they work for, as defined in Oregon law. 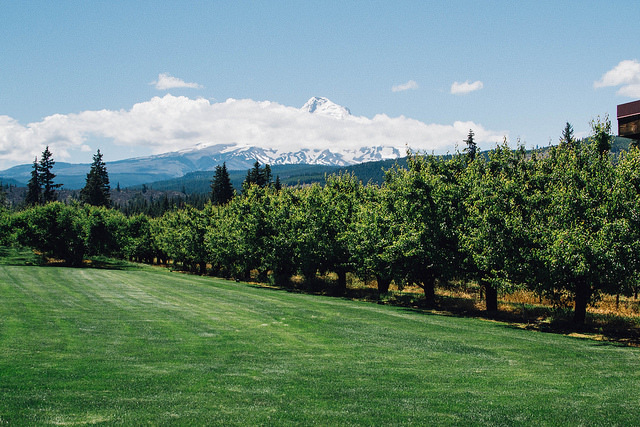 Orchards abound in the Hood River Valley. 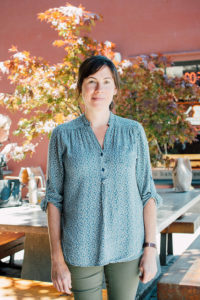 Trina McAlexander purchased Mt. 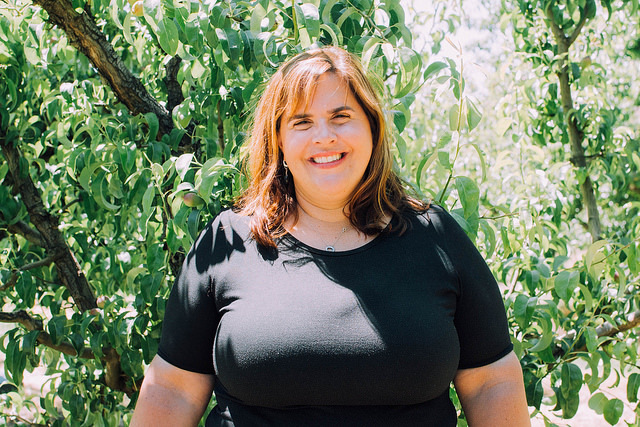 View Orchards from her parents a few years ago, and considers the 50-acre orchard a treasure. A third-generation female farmer, she grew up on this farm in Parkdale, Oregon, a town of 311 in Hood River County, according to the 2010 Census. While segregation persists and the charged national political climate is a serious setback, meeting Latino needs and strengthening relations between whites and Latinos are priorities for many here. Because state-issued IDs have become harder for immigrants and others to obtain, Hood River County approved a community ID card in June, becoming “the first jurisdiction in the Pacific Northwest to formally adopt a government identification card under a three-year pilot program funded by private grants and card fees that will involve ‘virtually no taxpayer funds or county staff time,’” according to The Dalles Chronicle. 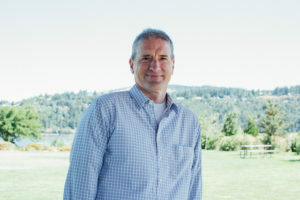 Once in effect, the card will allow county residents to connect with civic, public safety, and other community services, Hood River County School Superintendent Dan Goldman told the publication. The Columbia Gorge’s largest nonprofit social service provider with a large population of Latino clients, The Next Door has been training community health workers, who draw on their life experience to serve their community. The nonprofit is now using its successful model to help Latinos launch businesses, says Elizur Bello, director of programs at The Next Door. 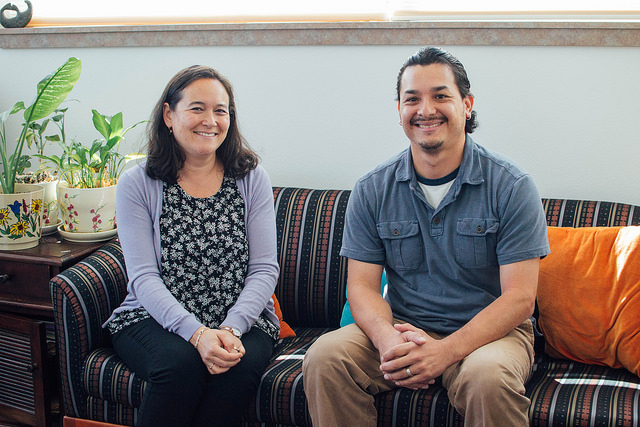 Listen to Janet Hamada and Elizur Bello of The Next Door, a social services nonprofit in Hood River County, Oregon, detail the community’s holistic mindset about health. The health department has made cultural competency a focus. The support staffers are bicultural; a few nurses speak Spanish. 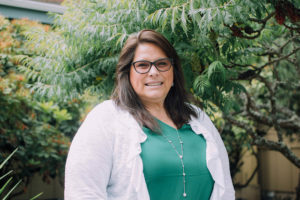 A working group has formed to decrease the stigma around mental health access for Latinos, says Trish Elliott, director of the Hood River County Health Department. Cultural competency takes other forms, too, such as ensuring materials are written in plain language and translated into Spanish as well as countering hidden bias and assumptions. Lindberg describes reorganizing the structure of community meetings for inclusivity and elevating individuals’ lived experiences in the design and implementation of programs. “One example of those assumptions came out of a realization that when we design cooking classes or programs, we need to understand that some people do not have all of the same cooking utensils to use, so we need to adjust,” he says. Another effort enlists Latinos to lead the design of farmers’ markets that include hot food, like tamales, and music to dance to, says Sarah Sullivan, executive director of Gorge Grown Food Network. Moreover, the old boys’ club of leaders is turning over here. 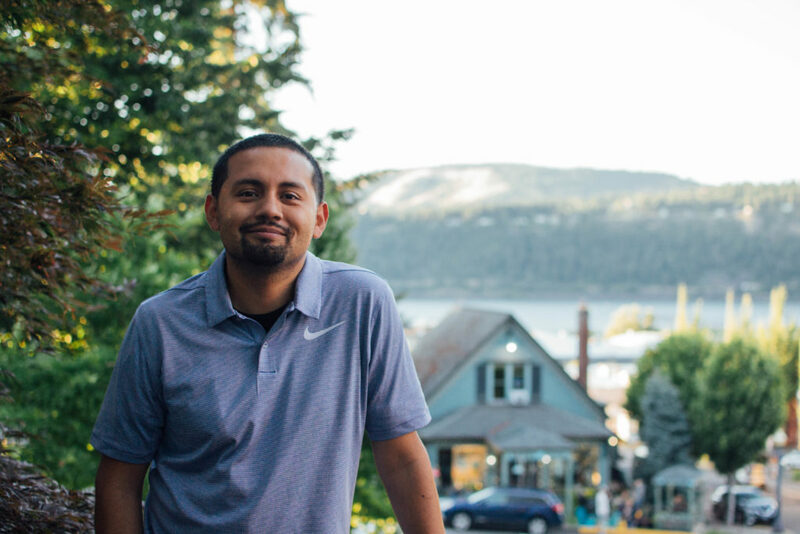 Hood River’s mayor is a non-native Spanish speaker and formed the Latino Advisory Council a few years ago; Goldman, the superintendent, named an equity and family partnerships director this year, as Latinos compose 46% of the local school population. Ricardo Lopez, who sits on the advisory council and the Hood River Chamber of Commerce, is a successful business owner. 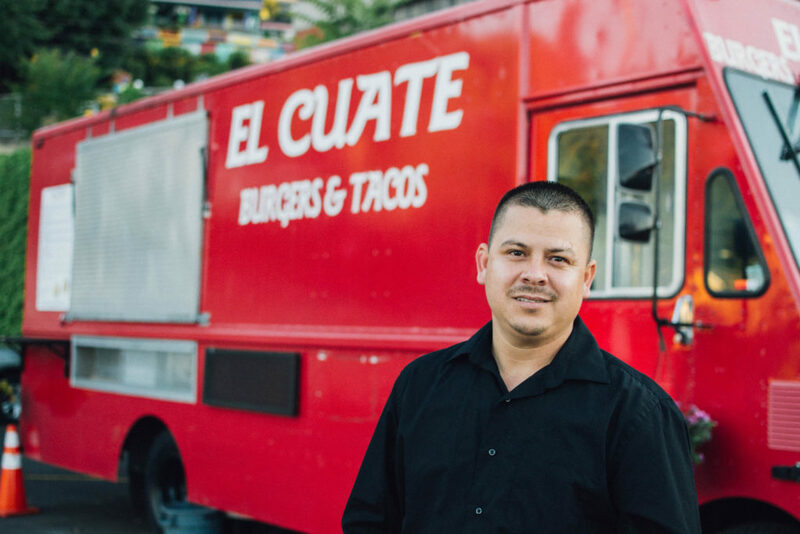 In 2015, Lopez opened the food truck El Cuate Burgers & Tacos. Previously, he worked at the local restaurant Nora’s Table, starting out as a dishwasher, then advancing to cook. He’s found people very supportive at work, and is friends with whites in the community, he says. Lopez’s small business advisor friend, Israel Ayala, says they sometimes experience racism. Ayala recalls a time when Google Maps took him the wrong way, and an elderly man rudely said he didn’t want him going through his road. A few months ago, armed homeowners warned Lopez after he stepped on their property. Lopez says about 80% of his customers are white because downtown is so expensive. Some have followed him from Nora’s Table. He values what they’ve taught him about appetizing cuisine. Now he includes a mix of greens, not just iceberg lettuce, and offers gluten-free, vegan and vegetarian options—which are not popular in Mexican culture. Customers encourage Lopez to open a restaurant. Yet he knows the overhead for a brick-and-mortar establishment would be much more than the $200 per month he pays now, and he and his wife want to buy a house. They currently live with their children in a mobile home in Odell, a Latino community in the county about eight miles south of Hood River. The availability and affordability of housing are long-running challenges in Hood River County. To address them, Mid-Columbia Housing Authority, which represents the five-county region, works with community partners, including The Next Door. Residents describe homelessness and the risk for homelessness as major problems. Elliott, who has spent time as part of the county health department connecting people with housing, says some rental waitlists are years long and people’s HUD vouchers expire while waiting. When residents were asked in a spring 2017 survey about the affordability of $1,200 rent for a two-bedroom house, “participants said that was barely what they know the average family earns a month, leaving no funds to pay for anything else,” according to a report by the City of Hood River and Oregon’s Kitchen Table, composed of a group of nonpartisan, nonprofit community organizations, helping to give Oregon residents a voice. The American Community Survey shows that 39.4% of people pay 35% or more of their household income toward gross rent in the Hood River zip code 97031. 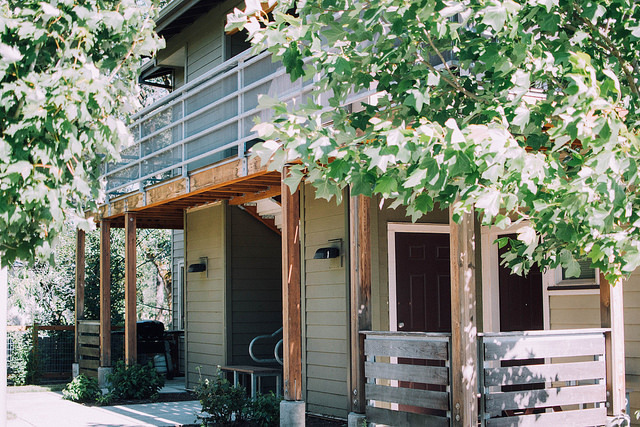 Hood River Crossing, an affordable housing development in Hood River County, Oregon. 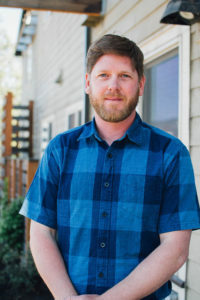 With changing demographics, there’s widespread recognition that Hood River needs to diversify beyond single family homes, says Joel Madsen, executive director of the housing authority. For example, the county sold the housing authority land below market value, enabling the development of Hood River Crossing in 2011, containing 40 one-, two-, and three-bedroom units. More affordable housing is in the works. In addition to developing and managing properties, the housing authority provides rental assistance and supports homeowners with down payments, financial literacy, accessibility upgrades to keep people in their homes and foreclosure assistance. Meanwhile, the number of vacation rental homes has skyrocketed in the past 10 years, helping to drive up housing prices. The median home value for the 97031 zip code is $330,600. It’s common for neighborhood blocks to be dark in the winter; short-term rentals (STR) are also a serious issue, residents say. In August, the County Board of Commissioners voted to require STR dwelling owners to provide proof that Hood River County is their primary residence. When it comes to the future of housing, community leaders are taking a visionary approach within the constraints, Madsen says. An effort is underway to develop the majority of undeveloped land in Hood River — with regular public hearings. The Westside Area Concept Plan, established in September 2016, is an “integrated land-use and transportation plan” for 450 acres within Hood River County that also “addresses parks, schools, utilities, and infrastructure funding,” according to hrwestsideplan.com. Downtown Hood River, Oregon, is full of boutiques, coffee shops, and restaurants.